It's the realm which cricket's mere mortals cannot hope to enter: the triple century. But when Michael Clarke became Australia's latest batsman to make 300, his dominance didn't just last one innings: it went for an entire year. To cross the mark of 300 in a Test match is to do something so unlikely, so set against by probability and ability alike, that its attainment is barely worth holding as an ambition. A distant dream, perhaps, but one that never gets past the theoretical. Get there, and you’ll create an innings that stands out among the multitudes, one innings that will be known thereafter only by your name. “Remember Clarke’s triple?” you can say. No need to mention the Sydney Cricket Ground, or the year 2012, or the opponents from India. They’re all implied. And when Michael Clarke made that 329 in Sydney, his rarity turned out to be the first step in another sporting rarity: the hottest of hot streaks, when a batsman for a brief period of weeks or months or occasionally years can do whatever they like, whenever they please. How better to start that run of untouchability than with a triple? The double century is infrequent but attainable. Over a really good couple of days, even modest batsmen sometimes get there. They can at least imagine the possibility. Not just because of the obvious anomalies, like Jason Gillespie or Wasim Akram. There are also plenty of specialist batsmen with underwhelming records: Jesse Ryder, Greg Blewett, Marlon Samuels have double tons. Jacques Rudolph is in the club with Wavell Hinds, Grant Flower, Sherwin Campbell. Kiwi opener Matthew Sinclair, barely averaging 30, got a double on debut and another two years later. Brad Hodge managed a double in a career spanning six games – his only Test ton. David Lloyd did the same in nine. Adam Voges got two in 20 games. Lou Vincent got one in a short career that ended in a fixing ban. But triple centuries – that’s where the gods walk. Sobers, Lara, Bradman. It’s been done 30 times in all. Lara and Bradman passed the mark twice. So did the less likely pairing of Virender Sehwag and Chris Gayle, players who scored so fast that their best knocks reached outsized proportion. Bradman should have had three, confirming his ascendancy over even the best of the best, but, in a near-miss as poignant as his batting average, he once ran out of partners on 299. The rest on the list are only there once, in the same way that lightning opts for a one-strike policy. Perhaps part of the specialness is because the triple century took so long to happen. Brian Lara is one of only two men to score multiple triple centuries. Tip Foster went close in 1903, putting together 287 for England in Sydney. That stood as the highest score by a visitor to Australia for over a century, until Ross Taylor made 290 in 2016. Foster also held the highest score at the SCG for nearly as long, until Clarke. But Foster didn’t get to 300. From 1877, when Test cricket began, 53 years passed before the first triple. England’s Andy Sandham remains the least likely entrant on the list, but was the one to start it off. He had a monolithic county career but only averaged 19 in his first Test stint. After five years out, he was recalled aged 39 for England’s first tour of the West Indies, made 152 and 51 in Bridgetown, followed that with 0, 5, 9, and 0, then finished up his career in Kingston with 325 and 50. A man of many moods. His big day came in April 1930. Three months later, Bradman bettered him with 334 at Leeds. Four years later, Bradman made 304 at the same ground. In the interim, Wally Hammond had made 336 not out against New Zealand, and in 1938 Len Hutton beat the lot with 365 against Australia. So a pre-war rush, then nothing for 20 years, and then Hanif Mohammad and Garfield Sobers traded triples within a series in 1958. In the 1960s, two Australian Bobs in Simpson and Cowper joined the list along with England’s John Edrich. 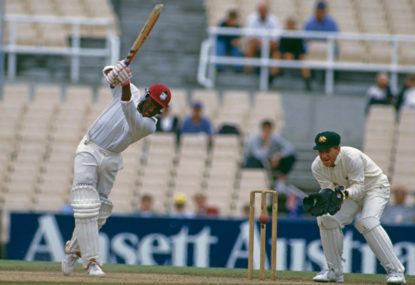 The West Indies’ Lawrence Rowe made the only triple of the 1970s, then it was silence until the 1990s with Graham Gooch, Lara, Sanath Jayasuriya and Mark Taylor. That meant half of Test cricket’s triple centuries to date came in its first 120 years. The other half came between 2002 and 2016, a tenth of that time. People will have theories about attacking batting, flat wickets, or short boundaries, though there’s also the fact that far more Tests have been played in the last few decades. Still, those 30 triples have taken well over two thousand Test matches. Australia has an especially interesting relationship with the triple. It was strongly associated with Bradman – his triples came in Ashes contests, not against weaker emerging sides. His 334 set the mark, while Simpson and Cowper made 311 and 307 respectively. After Cowper in 1965, no Australian came close until Taylor in Peshawar in 1998. Taylor’s decision to declare while level with Bradman’s 334 was more by accident than design. He was batting normally on 332, scoring a couple of singles in the last over of the day. He tried to score off the last two balls but both were saved in the field. Only while deciding what the team should do overnight did he consider that he’d equalled the Australian record, and that there might be some nice symbolic humility in declining to pass it. People appreciated the gesture. They talked of modesty and sportsmanship. Bradman wrote Taylor a nice letter commending his decency. None of which was enough to make Matthew Hayden blink when he passed it in 2003, but he was so busy carting Zimbabwe around the WACA that he probably didn’t know how many runs he had. He did know when he passed Lara’s world record of 375, before holing out for 380. And of course, there was really no reason why anyone should have to pull up short of a record. For Taylor, it simply happened to be a good time to declare anyway, so the symmetry happened to work out. Hayden wasn’t the captain, so it wasn’t his call. But for most people following the game, his record did feel cheap, beating up Test cricket’s weakest opponent on a home deck. There was none of the grandeur that should have accompanied the achievement. Which is also a reminder that statistics don’t deal in emotion. But it still felt right six months later when Lara flogged England for 400 and took his record back. Something in the universe had newly clicked into place. That was the context when Clarke made his triple century in Sydney. Bradman, Simpson, Cowper, Taylor, Hayden: a sparsely populated Australian contingent. Clarke also declared Australia’s innings when he was just short of Bradman’s mark, but there was no real sense that his 329 not out was chosen in deference to the Don. Had that been the case, he would at least have hit another boundary to get things close. There was more just the sense that the time had come. He’d had his fun and he wanted to bowl India out. That Indian team had been supposed to issue a stern challenge. It featured one of the greatest batting line-ups of all time: Laxman, Dravid, Tendulkar, Sehwag, all of whom had made big runs in Australia. The capable Gautam Gambhir opened the batting while a young Virat Kohli rounded it out. But perhaps it was one tour too many for the ageing order, or a result of their cursory preparation that saw them come into the Boxing Day Test straight off the plane. They were thumped in Melbourne and went to Sydney off kilter, getting bowled out for 191 to start the match. The most astounding part was that Australia were in trouble in reply. It was 3 for 37 when Clarke came to the crease. The fourth wicket fell at 325. The fifth never fell, a declaration coming at 659. India made 400 batting the second time around and still lost by an innings. The visitors had a modest bowling attack: Zaheer Khan started strong but soon tired, Ishant Sharma was out of sorts, while Umesh Yadav and Ravi Ashwin were very green. But right from ball one, Clarke was on. An early flash through the gully and a dropped catch in the 180s – that was about as good as India’s chances got. Picking off the straight and wide balls was how it began, then Clarke produced the batsman’s holy trinity against Yadav. The cover drive, the pull, the straight drive, three boundaries in three balls. He was 47 not out on the first night, having been asked to field that morning. Imagine what he could do… you could see history. The next day he carried on, whistling balls through the covers and whacking Ashwin for six after raising his ton. Ricky Ponting had become a resident of Struggletown after two years without a century. Such was Clarke’s command that Ponting was able to follow in his slipstream to finally get that 40th ton. When Ponting was out for 134, Mike Hussey chimed in with his own hundred. Clarke was up to 251 by the second night. Starting the next morning, the mind can go anywhere. Spectators can’t help themselves. Imagine what he could do. He could break Lara’s record today. He could blaze a hundred in a session. You could see history. And when a player reaches about 240, they start ticking off rivals every few runs, climbing the list of top scores from their country, or the ground, or against the opponent. Clarke was rattling through them, passing other Australians, passing Foster for the SCG record. But the triple alone was history enough, and that was the most tangible milestone to cheer for. 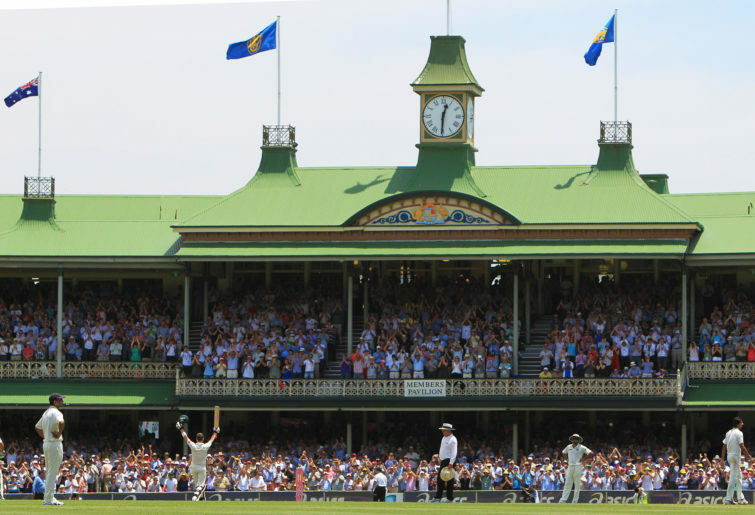 It was Pink Day at the SCG when Clarke set off down that final stretch, the third day of the match when all the fundraising efforts leave the whole ground drenched and draped in rose and fuchsia and carmine. Those crowds rose and seethed with each shot and each run. The straight drive to go to 299 was a classic of the genre. Then, unusually, Clarke didn’t initially raise his bat when the moment came. He left it on the ground, took off his Australian helmet, and held that up instead, pointing the badge to his audience. There was something pleasing about the simplicity of that action, even if Clarke was making a point to his former bat sponsor Slazenger, who hadn’t renewed their deal when it ran out a few days earlier. Each of his 329 runs was scored with a clean, unmarked blade. He batted through to the drinks break after lunch while Hussey reached an even 150. Then, during that breather, Clarke decided a lead of 468 was enough. It was only the third day. He could have batted another day and tried to make 500 if he’d been inclined. But 329 was enough. Well, enough for the day. Because it was only part one in the streak, one like few in cricket have ever seen. In the very next Test at Adelaide, Clarke took India for a further 210 in the first innings. It was January. His next home Test in November involved 259 not out against South Africa in Brisbane. Then back to Adelaide for a further 230 against the same team, plus a bonus little 106 against Sri Lanka on Boxing Day. Batting is a pursuit where even the very best in the game are supposed to fail about three times out of four. So the truly hot streak, where really big scores follow big scores, is especially compelling. Sunil Gavaskar launched his career with four hundreds and three fifties in eight innings touring the West Indies. George Headley started his with six hundreds in nine Tests in just over a year. Everton Weekes made five tons in consecutive innings and was dubiously given run out for 90 in the sixth. Clyde Walcott knocked off ten hundreds in 12 matches in the 1950s. Kumar Sangakkara in consecutive matches once made 200 not out, 222 not out, 192 wrongly given out, and 152. Steve Smith took his streak well beyond the confines of these briefer bursts, spanning four years with a century almost every second match. That’s the huge question when he comes back from suspension – can he recapture that magic? Or once the spell is broken, is it gone? And this, of course, is what makes Bradman such a marvel: his streak lasted his entire career. He turned it on like a tap over the course of twenty years. But Bradman aside, none of those players above ever racked up four double centuries within a year. That’s the measure of Clarke’s achievement. Bradman did it too, of course, within 12 months across 1930 and 1931. Virat Kohli matched that effort across 2016 and 2017. Neither of them did it neatly within a calendar year, like Clarke, but we’ll leave that sort of arbitrariness to tennis. Now that he’s not so much in the public eye, it’s easy to forget how good Clarke was. The hundred on debut in India, where so many Australians have been fed to local bowlers. 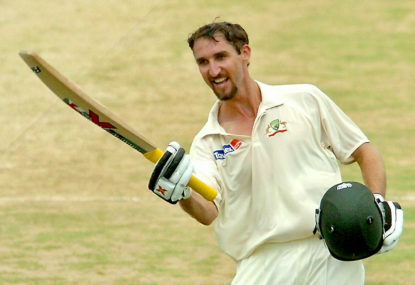 Back-to-back hundreds in the 2006-07 Ashes, turning around two dicey positions and making the whitewash possible. The exact same process in the whitewash of 2013-14. The Cape Town barrage in 2014, then the trials of the home season to follow. But nothing was better than those twelve perfect months, starting among the resolutions of a New Year’s Test; a purple patch born among a sea of pink. The triple century is the anomaly that no one can dream of or plan for. It’s just as well that in Clarke’s sequence, it came along first. With Foxtel showing every Australian home Test, ODI and T20I live and ad break-free during play, they’re the one-stop shop for all Aussie cricket fans. Get Foxtel today to make sure you don’t miss any of the great moments this summer with their dedicated 24/7 cricket channel. Geoff Lemon is a writer and radio broadcaster on sport, politics and literature. He’s on Twitter @GeoffLemonSport.